If you’d asked me twenty years ago about LGBTI people in Uganda, I would have said, “Where is Uganda?” Today, I count some Ugandans as good friends, and my friends are in big trouble. 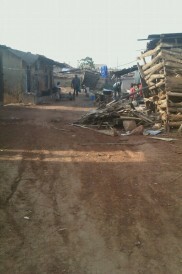 Where once he had a home, Bryan now lives in this slum of Uganda, in a one-room shack. Bryan was chased out of his job when his co-workers discovered he was gay. He now lives in the slums of Kampala, the capital city of Uganda. Often Bryan is starving and scared because being gay in Uganda is dangerous, especially with the passage of the Anti-Homosexuality Bill that punishes gays with up to a life-sentence in prison. The bill also punishes anyone who knowingly rents apartments to them or hires them for a job, so the LBGTI population is essentially left poor and homeless. Many gays are now in hiding in Uganda, or trying to escape the country altogether, since passage of the bill late in 2013. Bryan once held a solid job as a secretary for an organization in Uganda that helped people in need. He played soccer. He had a home and a lover and a regular life. Today, the best he can hope for is a good meal. “It’s because of you, Sis,” he said to me, about his full belly because I am the one who wired him money so he could afford food. Although the money helps him to eat, it isn’t yet giving Bryan a better life, and it is not a long-term solution. I have come to know several gay and lesbian Ugandans via Facebook (Facebook has to be good for something) and I have grown very fond of them. I got to know them well before the Anti Homosexuality Bill was passed, and for a long time, they tried to fight for their rights in an extremely homophobic society. 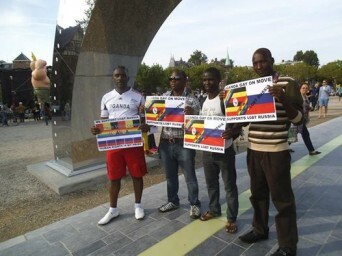 Gay Ugandans supporting gay rights for Russians. But who is supporting the gay Ugandans? I wired Harold money to get him to Kampala where he has a friend to stay with, to buy some food, and to get healthy. The plan is for Bryan and Harold to meet up and escape Uganda for South Africa once funds are raised. There are other Ugandans waiting for them in South Africa, offering their new home as a place to stay. Although the Ugandans who fled to South Africa are refugees, they have successfully found work and apartments. The only country in Africa I know of that is offering asylum and refugee status to the LBGTI people of Uganda is South Africa, a country that protects gays by law, thanks in large part to the legacy of human rights activist Nelson Mandela. Uganda is among the worst of the worst countries in which to be queer. How did things get so out of control? As is usually the case, white colonialism in the past, and current misguided American religious fundamentalist missionaries, have had a hand in making life miserable for these people. At the prompting of such American missionaries, the Uganda Parliament had been trying for several years to pass a “Kill the Gays,” bill. They toned down the punishment due to international pressure, but the Ugandan Parliament passed the Anti Homosexuality Law instead, calling for severe prison sentences (up to life in prison) for being gay. The speaker of the Parliament, a woman named Rebecca Kadaga, said passage of the bill was a “Christmas gift” to the people of Uganda. The President, after failing to get scientific “proof” that homosexuality is a defect at birth, signed the bill. The national tabloids in Uganda published photos of the “Top 200” suspected gay and lesbians in Uganda (which included Harold and Bryan) so they could be identified, punished, arrested, beaten etc. At the end of March this year Uganda had a “pride” celebration, which meant they had a parade to celebrate the passing of this heinous law. Bryan said the atmosphere during the parade was terrifying, as the media and the authorities encouraged a mentality of animosity and hatred, and encouraged the beating and torture of the gay population, even of those just suspected of being gay. Recently, I had a chapbook published, “What’s in a Butch’s Purse and Other Humorous Essays.” For the most part, this is a book about my special talent for having dysfunctional romantic relationships, told in a wry and light tone. It didn’t occur to me as I was writing the essays, or when the book was accepted, that someday, I would connect it to the atrocities being thrust upon the LGBTI population of Uganda. But I am using the book as a “perk” to raise money for Harold and Bryan – and others after I can get these two friends safely out of the country. There are two ways to give – on the Indigogo Campaign where I am looking for just $5-$10 contributions from numerous people to raise enough money to get these men to South Africa. Or for a $12 contribution, you can get a copy of my chapbook as a perk. 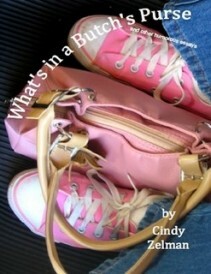 Although it is a slower way to raise funds, I am also donating all the proceeds from “What’s in a Butch’s Purse and Other Humorous Essays” to help the persecuted LBGTI population of Uganda by feeding those left in poverty until they can find a way out or until I can raise Indigogo funds to get them out. You can pre-order a print book or download the eBook by ordering here. Either way you decide to help will be deeply appreciated more than you know. The gay Ugandans I have met are some of the kindest and most grateful people on earth. Note: Bryan and Harold are real people, as I’ve described them, although I have changed their first names to protect their identity while they are still in hiding in Uganda. Posted May 7th, 2014 & filed under Activism. Is YouTube ‘protecting’ anti-gay church? If you cannot give, I still thank you for reading and thinking about the issue.